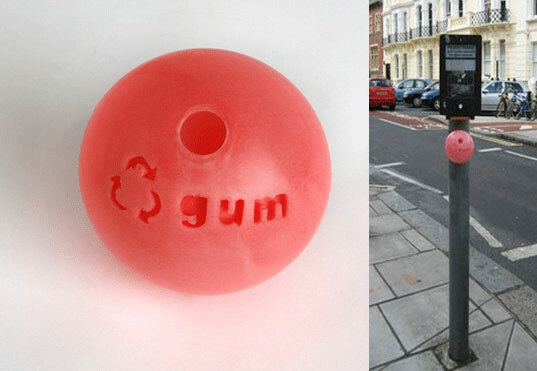 THE BUBBLE GUM BIN – Made From ‘Recycled’ Gum! Our streets our littered with used chewing gum, but next time your bubble loses its pop, don’t drop it—recycle it! Anna Bullus’s Bubble Gum Bin is made from Gumnetic, a new biodegradable material she developed made from sterilized used chewing gum and bio resin. The bin keeps chewing gum litter from our sidewalks and shoes and when full, the entire container is recycled to make even more bins. How’s that for cradle-to-cradle? Anna Bullus has also created the Gumnetic Chewy Pad, a comfy cushion comparable to memory foam cushions. Sitting on gum may not be so bad after all! Unfortunately this is a well meaning but impractical and unsustainable idea. This product would not stand up to the rigours of street life.. it's a student design project with good intentions - but sadly recycling used chewing gum on any level simply doesn't stack up. The cost of recovering gum, transporting it, storing it, treating it to remove bacteria, casting into a resin to make products out of it is totally out of porportion with the benefit that can be gained from any material produced at the end of it. Mixing waste into a resin is landfill by another name. You cannot granulate chewing gum and force it through an injection moulding machine.. no moulder in their right mind would do this for the sake of a marketing gimmick. The idea of babysitting a quantity of chewed gum .. invariably mixed with other bits of litter such as cigarette butts.. and contriving to make a product out of it is ill conceived. It's not that the intention isn't good.. it's just a shame when the project is not well thought through. Take it on Dragons Den and see how far it will get. It makes a great headline but it is a carbon negative process so people should stop pretending that chewed gum is a valuable resource that can be reused cost effectively. It just can't. Recycling chewed gum as a concept is as fundamentally unsound as the Gummy Bin claim to recycling gum for sports tracks. It's landfill... and if you were spending £200,000 on a sports track.. would you really want chewed gum and the bacteria that may contain mixed into your track? It's a ridiculous assertion that the Advertising Standards Authority should investigate - no one should be allowed to make unsustainable claims for the sake of headlines. There is no proof Gummy Bins have recycled anything.. it is a marketing gimmick which is not supportable.. When asked they say that the 'recycling gum' claim was the company that started Gummy Bin (which fell on hard times and was bought by Straight Plc in a fire sale). Straight simply say.. they don't do the recycling gum thing now. If products claim to be made from recycled material .. or suggest the waste they collect can be recycled.. they must be able to prove beyond a shadow of doubt that their claims are supportable. This is a great idea.. and the world needs good ideas.. but sadly it is not realistic. Back to the drawing board for Gummybins and for Gumnetic. It would be great if you would sell your product. This is something that you should consider. I would definitely buy one. Great invention. I think its a great idea!!! It saves u from the filth & gives more rubber!!! Its genius!! so what is the logical end of this product.......although you are "recycling" you are multiplying the bins each time it is recycled and more and more bins will be created.......until the world will be overflowing with bubble gum bins................just a thought.... the trouble with tribbles anyone? i think chewers who intentionally refuse to dispose their gum in the right places would unlikely think about recycling. A place to put your gum? Besides the trash cans that are on almost every corner in the city? Hmm, but maybe some people don't realize that tossing your gum on the sideWALK where people, uhhh, WALK, is littering and gross. The re-recycling is pretty awesome though. If different colors and flavors of gum are deposited in the round bin, does that effect the color of future bins? Or are they all pink? Pretty useless question but thought I'd ask. The question to ask is really: can you make more gum with it? Don't tell us if you can, seriously, just do it and laugh. BTW, people who litter gum are a-holes... I'm just saying. This is a good idea, but the hole looks pretty small to me. How are you supposed to get your gum in there without touching the sides or missing the hole. I'd hate to have to poke it in with my finger since the the rim of the hole would be all slimy with spit and gum juice. Great idea. Never knew old bubble gum could be useful. This is a great idea but as per the previous post, 'chewers' behaviours will have to change around the way they dispose of their gums... I have always thought that gum company should be held responsible for the damage gums have on our cities - sidewalks, bus & theater seats, etc. The same way tobacco companies have had to pay money towards advertising and communicating that smoking is dangerous, gum companies should spend money on enticing consumers to dispose of their gums in a sensible manner. Does she chew the gum herself? :-) The bin sure looks good enough to chew. Maybe if people can't be bothered to use the existing trash containers for gum they will be inspired to use these containers. THE BUBBLE GUM BIN - Made From 'Recycled' Gum! Our streets our littered with used chewing gum, but next time your bubble loses its pop, don’t drop it—recycle it! Anna Bullus’s Bubble Gum Bin is made from Gumnetic, a new biodegradable material she developed made from sterilized used chewing gum and bio resin. The bin keeps chewing gum litter from our sidewalks and shoes and when full, the entire container is recycled to make even more bins. How's that for cradle-to-cradle?